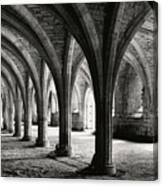 Stone Arches by Michael Hudson - 16.000" x 6.875"
Stone Arches canvas print by Michael Hudson. Bring your artwork to life with the texture and depth of a stretched canvas print. Your image gets printed onto one of our premium canvases and then stretched on a wooden frame of 1.5" x 1.5" stretcher bars (gallery wrap) or 5/8" x 5/8" stretcher bars (museum wrap). Your canvas print will be delivered to you "ready to hang" with pre-attached hanging wire, mounting hooks, and nails. Great image Michael! Congratulations on your $ale! I love this shot. 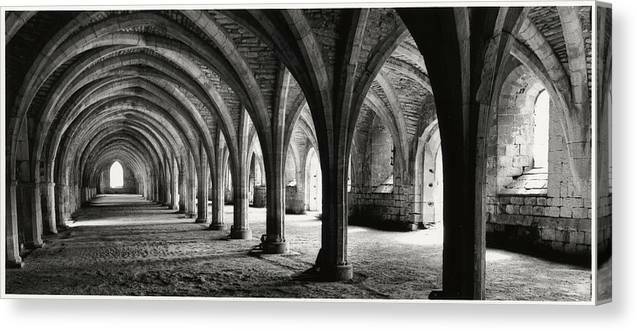 I dream of finding a scene like this to shoot! 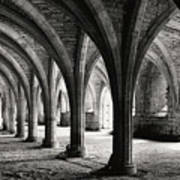 The refectory (dining room) at Fountains Abbey in North Yorkshire, England. Original shot on black and white medium format film and hand printed in a traditional darkroom.